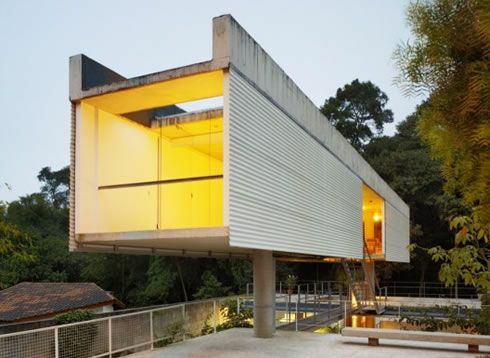 The Carapicuiba House was designed by Angelo Bucci and Alvaro Puntoni. With a name that describes the location of the building- Carapicuíba, Brazil – the house has both an interesting layout and an unusual topography. Looking at the house from the street, the ground level is hidden to the eyes. The ground falls abruptly to reveal another platform, 6 m below. This is where the main living spaces are situated. Because of the inhabitant’s need to incorporate spaces for an office, the residence was divided into living spaces and business accommodations. The street level incorporates two different areas, connected by a steel bridge: one that lays on the ground and one that lays on top of the lower levels of the building, acting like a roof terrace. Architects explain how the lower part of the house was created to suit the inhabitant’s needs: “The house is divided into two levels, both below the street level. Its spaces are integrated with the woods, valley, gardens, and pool located at the ground level. The house incorporates the outside nature indoors: a sliding glass door opens the living room into the terrace, creating one large space. The bedroom and the patios can also be integrated at the lower level.” The concrete and glass construction was designed based on the site’s geography and landscape, so take a look at the pictures to understand the residence’s beauty and modern equlibrium.